Finding a wheelchair that works for you doesn’t have to be hard. With the help of this guide, you can easily make an informed decision. If you're not sure what type of wheelchair you need, you can use the chart below to see the basic differences between the four main types of wheelchairs: transport wheelchairs, manual wheelchairs, mobility scooters and electric wheelchairs. Click on the name of any of the mobility chair types listed in the chart below to learn more about it and its uses. This guide also includes a mini-guide to wheelchair cushions for those who need a cushion for their wheelchair but are not sure what type to get or how much they really need to spend to get a cushion that will work for their needs. Manual Wheelchair $125 - $550 Effort required Easiest 35 - 40 lbs. 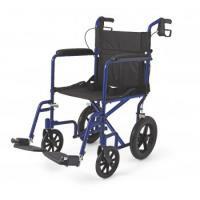 The least expensive and lightest mobility chair is the transport wheelchair. Since they are designed to be propelled by an attendant, they are also known as attendant or companion chairs. Their average weight of 15 to 20 pounds means easy transportation and storage. With this push-chair, you may want to look into cushions for extra comfort, especially if you will be using it for longer periods of time. 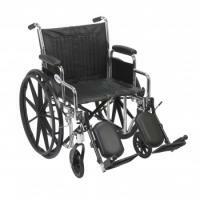 Heavy duty transport wheelchairs should be used for heavier individuals. For independent individuals with enough upper body and arm strength, the manual wheelchair is the most efficient and affordable option. 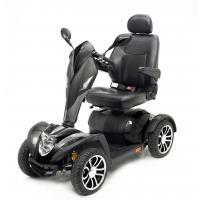 Self-propelled wheelchairs are propelled by the occupant by turning the rails of the large rear wheels. These standard wheelchairs are durable and are great for long-term use, especially since they need less maintenance than their powered counterparts, and the physical activity it provides is beneficial to the user's overall health. This basic wheelchair, which can weigh up to 40 pounds, can be folded and supports, on average, up to 250 pounds. For a lighter chair that requires less effort for both maneuvering and transporting, you may want to consider a lightweight wheelchair, which can weigh as little as 27 pounds. Bariatric wheelchairs, also known as heavy duty wheelchairs, may be significantly heavier than standard wheelchairs, but they provide better durability and a higher weight capacity for higher than average weights. Reclining wheelchairs have controls that allow the backrest to recline from its normal upright position. 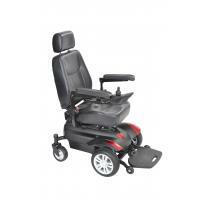 This type of wheelchair may be necessary or preferred by people who spend longer periods of time seated in a wheelchair or individuals recovering from surgery or an injury. Electric scooters for adults, also known as medical scooters, are a fun and more modern alternative to power wheelchairs. For the price-conscious customer, there are many mobility scooters available at a lower cost than any of the electric wheelchairs. Medical scooters are navigated by the occupant with a mechanical tiller system that has direction and speed controls. Although they are more difficult to transport and maneuver, these power-operated vehicles have the advantages of a swiveling seat that makes it easier to get on, and longer distance capacity on a single charge. Medical scooters may be recommended for individuals who can safely and independently sit down and stand up, have good sitting balance, and have sufficient hand and finger coordination to operate the tiller. When choosing a scooter, you will need to know whether you prefer a scooter with three or four wheels. 4-wheel scooters are good for outdoor use, especially when the terrain is rugged, while 3-wheel scooters provide more legroom and are better suited for indoor use, especially since the single front wheel allows for a higher turning radius, making them easier to maneuver in tight spaces within the home. Most (but not all) power scooters available today can be either disassembled or folded, and these portable travel scooters are recommended for those who like traveling. Another important thing to consider when purchasing a medical scooter that will be used for travel is to have an extra battery or two stored in the built-in battery storage compartment. With a motorized wheelchair, less mobility doesn't have to mean less independence. Power wheelchairs have an electric motor and are navigated with an easy-access control interface with a joystick and a set of buttons. This system makes motorized wheelchairs the easiest user-operated wheelchair, requiring the least physical exertion. In addition, electric-powered wheelchairs are more maneuverable on uneven ground than scooters and transport wheelchairs. Power wheelchairs also have a tighter turning radius than scooters, allowing for a higher level of independence. Pediatric wheelchairs are designed with kids in mind, with seat width and depth adjustability to accommodate children's growth. These chairs are typically lightweight and have an average seat width of 14 inches. Wheelchair cushions are an important part of making your wheelchair comfortable and safe. 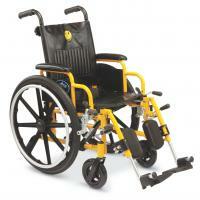 Pressure management, positioning and sitting stability can all be provided with the use of wheelchair seat cushions. Cushions for wheelchairs vary by the material it is filled with: air, foam or gel. Today, there is also the option of a Gel Foam cushion, which is, as its name suggests, a combo foam cushion with gel packed inside. Choose the type of wheelchair cushion best suited to your individual needs by referring to the chart below. Many customers prefer foam cushions because they are inexpensive and lightweight. 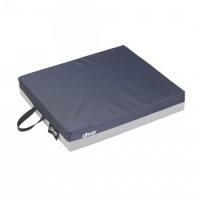 A contoured foam cushion provides improved sitting stability and comfort. The most popular cushion is the Gel/Foam variety, a relatively inexpensive but dependable cushion that offers better pressure relief than foam cushions. Gel cushions such as EquaGel are more expensive, but they can be contoured for better support and excellent pressure distribution. EquaGel is more durable than regular gel cushions because it is filled with solid gel and won’t leak like their liquid counterparts. Air cushions are used by patients at high risk of pressure sores and need proper maintenance to ensure that they’re functioning properly. The higher-priced cushions are quality cushions designed for therapeutic purposes such as sore prevention. Your needs are unique, and it’s easy to make your wheelchair unique, too. Add accessories such as wheelchair cup holders, trays and accessory bags for your convenience and wheelchair parts like anti-tippers, break extensions and seat belts for your safety. 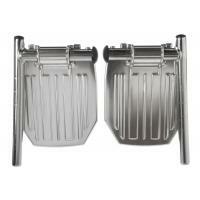 Also look into options such as portable wheelchair ramps and wheelchair replacement parts. At AvaCare Medical, we’re here to help you find a wheelchair that works for your needs. If you’re still confused about your options, give us a call today at 1-877-813-7799. Disclaimer: No information presented on this website is medical advice or intended as a substitute for the advice of a physician. All information on this website concerning medical conditions is from publicly available sources. Was this article helpful? Help others; pass it on! Call our helpline at 1.877.813.7799. Send your questions, concerns or comments any time.